Here is a quick recap and look at some wonderful wines from the 2010 and 2011 vintages from Germany, with more notes to follow in Part 2 next month. 2011 Muller-Catoir, Riesling Trocken, Pfalz, Germany. Muller-Catoir’s 2011 lineup is an all-star lineup of wines and across the board offers some of the best Rieslings of the vintage, but certainly this entry offering should not be missed as it looks like a lock to be the value wine of the year from the Pfalz. As people come around to dry German wines, we are seeing better and better Trocken available and this 2011 Trocken Riesling is a stunning example with chalky minerals, zesty lime and a brisk crispness that is tingling and refreshing. This Riesling starts with bitter green apple, lime flowers, tangerine and wet stones before a palate of white peach, saline, slate, tangy citrus and hints of tropical essences. This dry Riesling is delicate in detail and has lots of vivid acidity, making it better for lighter cuisine and not spicy Asian faire, but it is so good you’ll find almost any reason to open a bottle, I know I’ll be enjoying this wine when it arrives in the fall of 2012, it should drink nicely for 3-5 years. 2011 Muller-Catoir, Riesling “Haardt” Kabinett Trocken, Pfalz, Germany. One of the best dry Rieslings around, and a very exciting wine with plenty of stuffing and vigor, this 2011 Muller-Catoir is a keeper! As a long time fan of Muller-Catoir it is great to see the latest wines have not lost any of their elegance or energy, in fact this 2011 set is stunningly attractive and have made me fall in love with this wonderful winery all over again. The 2011 Haardt Kabinett Trocken just begs to to be enjoyed and while strictly dry and zippy it feels round and lengthy with lovely white flowers, peach and tangerine while hints of lime, passionfruit and chalky minerals add complexity. There is a salty and citrus burst mid palate with orange and white tea notes along with a slate/flinty briny touch, and the finish is firm, crisp and zesty, but again the tropical notes linger on. This pleasure filled Riesling grips you like a great Burgundy and keeps you entranced in it’s spell. 2011 von Winning, Riesling, Diedesheim, Pfalz, Germany. 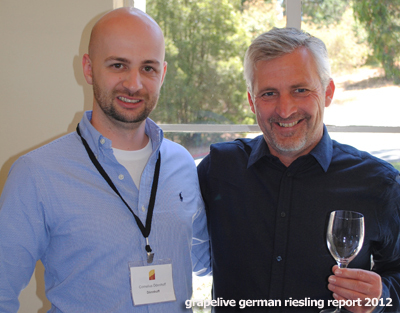 This is a great introduction to dry Germany Riesling that strive to be the showcase for the modern style, and will give you an idea of what “Grosses Gewachs” are all about. Von Winning’s intense pursuit of Grand Cru class Riesling has created a major buzz in the wine world and their efforts are turning heads for many reasons, like the fact they are making extremely dry wines that are barrel fermented and aged on the lees, much the same way White Burgundy is crafted, all of which differs dramatically from common practice and from what consumers have come to expect. That said, the German domestic market is all about dry wines and these new drier Rieslings are just what the home market want, and are willing it seems to pay for, in fact some of von Winning’s top Grosses Gewachs sell for close to $100 a bottle. So it was great to see this new offering from von Winning that will give insight to new customers about this style of wine, and I can tell you it is a steal at this price and I recommend grabbing as many as you cab find when it is released later this year. Terry Theise, the importer, convinced von Winning to produce this cuvee for the American market, and bless him for doing so as this is truly a stunning wine that shows all we love in Riesling, but delivers it in a dry and intriguing fashion. The 2011 vintage is much more friendly and lush than the severe 2010, and this beautiful and charming wine gives fresh detailed layers and lush fruit, while still being brisk and lively in the glass. Von Winning’s 2011 Riesling starts with lime and tropical notes with hints of mango and peach pit while a core of green apple and grapefruit burst through on the palate with vibrant force while lemon/lime and spicy mineral essences add to the complexity with a touch of slate like smokiness and brioche as well. While not as lessy and full as their top wines, this Riesling still shows pure class and vivid flavors and should not be missed. 2010 von Winning, Riesling “Langenmorgen” Grosses Gewachs, Pfalz. 2010 von Winning, Riesling “Kieselberg” Grosses Gewachs, Pfalz. 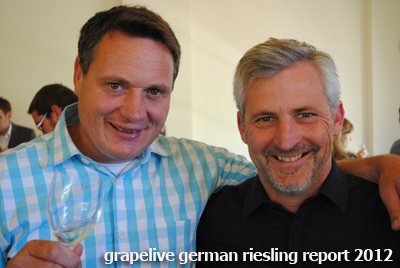 The Deinhard family’s von Winning wines are severe and extreme examples of dry Cru Riesling from their “Grosses Gewachs” sites in the Pfalz which are intensely dry and firm, but not with out some charm and intrigue. The Kieselberg is dramatic and is full of tangy crisp grapefruit, lime and orange rind which hits you like a blast of citrus while hints of green apple and stone fruit hide behind at this stage. With coaxing and a touch of air you’ll find chalky minerals and tropical fruit, but this wine is tight and wound up, so it will be interesting to see where it goes in a few years. I have the feeling the acidity will give way to a prettier and more complete wine over time, though who knows and while there is a huge market for drier wines, these wines can be a shock to the system. There is plenty of natural extract and depth in this unique Riesling and the finish does hold lots of interest, so while I’m torn on what will come, I’m sure this style has it’s place. 2011 Selbach-Oster, Riesling “Incline” Mosel QbA. 2011 Selbach, Riesling, Spatlese, Saar, Germany. This beautifully balanced Riesling has bright fruit intensity and pretty floral tones with a slight refreshing sweetness. The nose has hints of yellow roses, citrus blossoms and tropical essences while the palate has candied pineapple, peach and green apple layers with a touch of honey, saline, mineral spice and slate. The vintage gives a lightness and lift that makes this charming wine a playful friend and a super summer wine. The tangy/sweet balance and the hint of apricot on the finish make for a pure and interesting Riesling on it’s own, but this wine will go with lots of foods from smoked ham to seafoods, as well as many Asian foods and styles. 2010 Selbach-Oster, Riesling “Himmelreich” Kabinett Halbtrocken, Mosel. 2010 Selbach-Oster, Riesling “Schlossberg” Kabinett, Mosel. 2010 Selbach-Oster, Riesling “Zeltinger Schlossberg” Spatlese, Mosel. Almost every vintage Johannes Selbach makes better wine or comes up with a new expression, it truly is amazing the attention to detail and heart goes into every wine at this fine estate on the Mosel. While 2010 has proved a difficult vintage, it is also a collectors year to put away as the wine are full of natural extract and intensely flavored with gripping acidity and they will need patience and time in the cellar to show their best. While the Kabinett and QbA’s were not quite as pleasing in their youth, the Spatlese and Auslese are beyond sublime and should age many decades, so if you loved aged Riesling, well who doesn’t? You need to grab 2010 Spatlese and Auslese, and I suggest you take a look at Selbach-Oster, especially this 2010 Zeltinger Schlossberg Spatlese. This beautiful and crystalline Riesling opens with white flowers, mineral tones and zesty citrus before revealing green apple, tropical notes and a hint of apricot stone. The heighten vibrant acidity hides the weight and sweetness keeping everything alive and balanced, you can just tell this wine will age majestically for many a year. As alluring as it is now and the richness that comes through in the glass it will only get better and better, so lock a few bottles away if you can keep your hands off them. Trust me, as someone that has drank all of his Riesling like a heroine addict, hide it good… Mosel wines tend to be fresher and brighter with more exotic and subtle flavors and this one has all that and more, note to self: Buy and save. 2010 Selbach-Oster, Riesling “Zeltinger Sonnenuhr” Spatlese (Auslese Must Weight) Mosel. 2010 Selbach-Oster, Riesling “Wehlener Sonnenuhr” Auslese (TBA Must Weight) Mosel. 2010 Weingut Spreitzer, Riesling “Wisselbrunnen” Erstes Gewachs, Rheingau. 2011 Weingut Spreitzer, Riesling “101” QbA, Rheingau. Spreitzer’s 101 is a little entry level Riesling somewhat geared for beginners, but even so it is a fine and lovely wine with plenty to admire. Bright and tangy fresh the 2011 Weingut Spreitzer Riesling “101” is a pretty white with lime, apricot, peach and honeydew flavors along with some white flowers and mineral tones. This zesty Riesling has just a touch of sweetness, but is balanced with citrusy acidity and hints of savory saline with only a whiff of petrol. This fun wine is not overly complex, but it drinks great and offers some good value for the asking price, drink over the next 2 years. 2010 Weingut Spreitzer, Riesling “Oestricher Lenchen” Kabinett, Rheingau. 2011 Weingut Leitz, Riesling Eins Zwei Dry “3” Rheingau. 2011 Weingut Leitz, Riesling “Rudesheimer Berg Kaisersteinfels” Terrassen, Rheingau. 2009 Weingut Leitz, Riesling “Leitz Out” Rheingau, QbA, Germany. I decided to re-visit this 2009 Leitz Out to see how it was doing, and to tell you the truth I have a favorite restaurant, Burma Superstar in San Francisco on Clement Street, that pours this by the glass and I have it every time I go. This 2009 is still fresh and full of flavor, and has filled out a touch making it a joy with the spicy Burmese food, though it is wonderful on it’s own as well with just a hint of sweetness. The vintage 2009 was pretty awesome across the board, but fairly ripe, so it is great to see this entry level Riesling showing so well, so well I opted for a whole carafe. The nose starts with tropical fruits, white flowers, slate and a whiff of petrol before a flowing palate of green apple, peach, nectarine, dried/candy pineapple and tangy stone fruits with hints of honey and lime. This is pure and refreshing Riesling that is simply delicious and should be for another few years yet. 2011 Weingut Leitz, Riesling “Leitz Out” QbA, Rheingau. Joannes “Josi” Leitz’s fun “Leitz Out” Riesling is more serious than the playful label would suggest and gives a whole lot of pleasure for a great price. After years of hearing his last name pronounced incorrectly, he decided to turn a phrase on his label to help people say Leitz as it should be, as in “Lights” and the Leitz Out was born, so for about $14 you get a great fresh Riesling and a touch of language help. Not that my German is Nicht Sehr Gut, I do know how to pronounce both Riesling and Leitz, now I hope more people will too, plus they will enjoy the wine. The 2011 Leitz Out is bright and citrusy with hints of lime, orange zest, green apple and stone fruit while hints of mineral, pineapple and white flowers linger in the background. With air you get a touch of sweetness, fuller mouth feel and a whiff of petrol. While mostly zippy and dry this Riesling has some good depth and will go great with lots of different foods and is perfect for some fun on a warm summer day. 2011 Weingut Leitz, Riesling “Dragonstone” QbA, Drackenstein Rudesheimer, Rheingau. This yellow fruited Riesling from the Drackenstein, or Dragonstone is a wonderful expression of the unique quartzite, clay and slate soils that these grapes are grown on above the Rhein between Rudesheim and Assmannhausen. Leitz has his own block to farm and source from this terroir that are on steep well drained slopes facing southeast which allows plenty of sunlight giving good ripeness to the wine. I have been luck enough to have walked these breathtaking vineyards that overlook the Rhein and Rhein Islands and back up to a hilltop forrest that is popular with hikers and wildlife. The 2011 Dragonstone is fruity and fresh with loads of acidity and bright flavors that include mango, yellow peaches, tangerine and spiced apple while hints of lime flowers, honeydew and mineral essence linger. With a touch of sweetness and a nice round body this wine is drinking great now, but should develop more complexity and character over the next few years. I enjoyed this beauty with a spicy Korean BBQ meal and it was near perfect and it is an enjoyable summer sipping wine with low alcohol which makes for a good lunch or picnic quaffer too. 2011 Weingut Leitz, Riesling “Rudesheimer Klosterlay” Kabinett, Rheingau. The Leitz Klosterlay Kabinett 2011 is flat out a dynamite wine with lots of energy, terroir and transparency plus it is a steal for the quality that Weingut Leitz, Johannes Leitz and Eve Fricke put into the bottle. Rudesheim has many Cru sites, like Berg, Schlossberg, Rotland, and others and many soils such as red, grey and brown schist which all play dramatic roles in the wines of the region and especially Leitz where you can really taste, feel and smell each site. The Rudesheimer Klosterlay for me has a peachy note and vivid citrus with a softer slate mineral tone that sets it apart. The nose is lively white flowers, lemon/lime and a touch of flinty rocks white the palate has white peach, apple skin, pineapple and hint of verbena. I tasted this beauty very young and I look for lots of secondary complexities to show more fully over the next few years and it should drink fantastic for a decade. I love the fresh delicacy it shows and the vibrant zesty acidity which makes me think I’ll be hard pressed to save many bottles, as it is so pure and delightful now. It is no surprise at all that Leitz is so critically acclaimed, and fresh of garbing a winemaker of the year award, these wines are stunning. 2011 Weingut Leitz, Riesling “Rudesheimer Magdalenenkreuz” Spatlese, Rheingau. 2011 Schlossgut Diel, Riesling “Dorsheim Goldloch” Kabinett, Nahe, Germany. Diel makes an array of fantastic wines from the Nahe region and has been a leader in making a modern dry Riesling for a few years now, but I found this lush Kabinett to be one of my favorites of their impressive lineup of 2011 Rieslings. Schlossgut Diel also makes a stunning Rose of Pinot Noir as well, which I also sampled recently and the delicacy in the winemaking shows throughout the collection of fine and pretty wines made by Armin and Caroline Diel. I must admit my first impressions of Diel wines were of severe wines, but now I have come to see the artisan craft and style they are, Riesling is a continuing educational journey for me and these 2011 Diel wines are pure heaven in the glass. The 2011 Dorsheim Goldloch shows bright floral tones, candied citrus, mineral spice and peachy fruit with tasty lime and apricot gaining momentum on the fresh palate. This wine has refined acidity that keeps this tense, but allows the fruit shine and a touch of sweetness feels just right and heightens the whole experience. Hints of white tea, slate and passionfruit add to the complexity and at 8.5% Alcohol it can be really enjoyed liberally. 2011 Weingut Donnhoff, Riesling “Trocken” QbA, Nahe. Donnhoff’s dry QbA is a little gem with bright fruit and vivid layers making for a very versatile wine. This fresh Riesling starts with citrus flowers, hints of yellow stone fruits and apple skin leading to a zingy tense palate of lime, grapefruit, green apple and a core of peach fruit while tropical elements, mineral tones and orange zest play in the background. Donnhoff is without question one of the stars of the vintage in 2011 and at every level their Rieslings are excellent and well crafted, so there is no going wrong in picking a wine rom this estate in the Nahe region, especially this lively and crisp white that delivers pure Riesling goodness and in the modern dry fashion. 2010 was very hard on the estate QbA and Kabinett wines with harsh acidity, but 2011 is great and makes these same wines fantastic and super values, so matter what style you prefer 2011 is a vintage to buy up. 2011 Weingut Donnhoff, Riesling “Estate” QbA, Nahe. 2011 Weingut Donnhoff, Riesling “Oberhauser Leistenberg” Kabinett, Nahe. 2011 Weingut Donnhoff, Riesling “Kreuzenacher Krotenpfuhl” Kabinett, Nahe. Being a huge fan of Donnhoff, it was great to see the 2011 wines were up to the highest standards, per normal for this Nahe estate and that especially the drier Trocken and Kabinett Rieslings were even more impressive than the 2010 wines. The Kreuzenacher Krotenpfuhl was totally new to me and while I loved all Donnhoff offerings I tried, of the 2011 vintage, it was this amazing Riesling that stood out and I hope you secure a few bottles when released here in California this month. Cornelius Donnhoff’s wines are magic, glorious and world class putting Donnhoff in the top echelon of German wineries and a leader in his Nahe region. The 2011 Donnhoff Kabinett Kreuzenacher Krotenpfuhl is rich without being heavy or sweet and has elegant perfume of citrus blossoms and a mouthful of tangerine, apricot, lime and green apple with liquid mineral pureness and hints of honey, pineapple and wet slate essence. While peachy and fruit driven the acidity is zesty crisp and keeps things vivid and tension filled, and this Riesling thrills through out. 2011 Weingut Donnhoff, Riesling “Dellchen” Gross Gewachs” Nahe, Germany. I doubt if many people will see this wine, but I just have to mention it, because it might be one of the finest dry white wines I have ever had from Germany, and it certainly rates merit here. This wine is almost perfect and should see even more gains in depth and beauty over the next dozen years, and while I adore Donnhoff’s sweeter wines and will cherish their Spatlese, this wine is something extraordinary that transcends questions of grape and terroir, it is on par with anything from anywhere in the world, be it Burgundy or the Sonoma Coast. Of course it is true and reflective of it’s sense of place, and without question it screams Riesling with brilliant and vivid layers of intense flavors and acidity. The nose is smoky with rocky mineral essences and zesty citrus flowers and fruit before a spine tingling palate of pure energy driven by lime, mango, green apple and tangy stone fruits while white tea, nectarine, orange and grapefruit add to the unfolding force that comes through throughout this magical wine. Secondary notes of peach pit, apricot and melon linger on and on here with some savory elements. This wine walks the tightrope between power and delicacy to near perfection and is fantastically entertaining in everyday.